Oh, how the days of anticipation and planning have flown past! 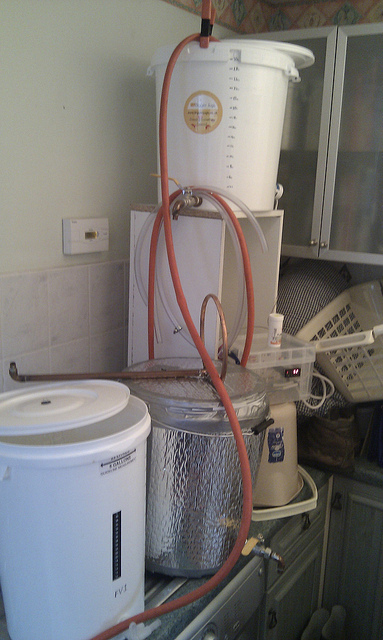 A brief history – if I may be so indulgent – late in the year 2009, for some forgotten reason, but possibly because of some time wasting chat at work, a rather tall scotsman started to take an interest in the world of homebrewed beer. Despite the search term ‘homebrew’ fetching back some rather perplexing sites talking about unpaid software developers writing code for various electronic devices, eventually THBF was discovered, and a login procured. Now as this tall scotsman’s Mrs wasn’t exactly keen on the idea, he instead proposed a starter kit as a Christmas present. Not that his wife was swayed, but his almost equally unfeasably tall sister did, and one plastic barrel and some odd tubes and a very long egg flipper were gifted on that day. Full of enthusiasm, but woefully short on knowledge, the two cans of concentrated wort in the Scammonden Dark kit were diluted in the plastic barrel, and then the dawning realisation that you couldn’t drink it straight from the barrel!! Oh, the naivety!!! After some searching, the cheapest solution (well, it was right after Christmas!) was to buy a silly amount of ‘flavoured spring water’ from Asda. Now there is only so much flavoured fizzy water even this family can drink, and with all three kids burbing away the remainder was ceremoniously poured down the kitchen sink to make way for the glorious beer they would soon hold. The syphon tube and little tap turned out to be a rather messy thing to handle on one’s own, and lacking a third hand to hold the tube in place, while holding the tap in place above a bottle while also operating the crazily stiff tap it was, simply, never going to work. 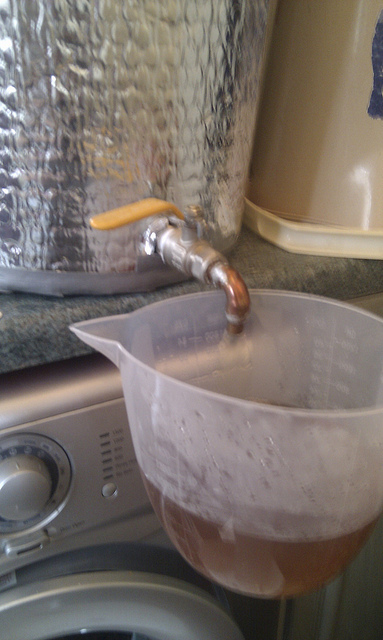 A (clean) finger was employed to start and stop the flow of beer instead. Not all the aiming was spot on though, and the flow not always stopped quite in time, as a slowly expanding lake of beer on the kitchen floor attested. Still, at least it smelt nice. After a patient wait finally the beer was ready to be drunk, and the tall scotsman was most impressed. 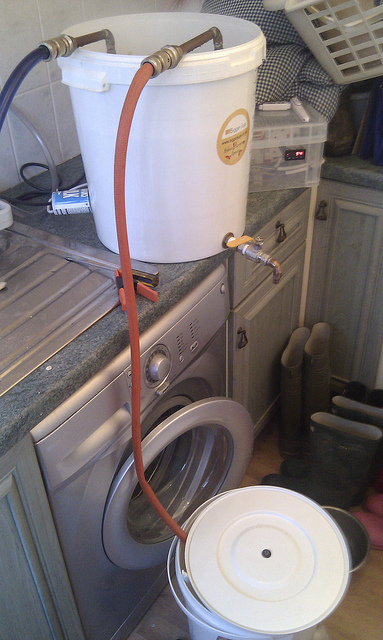 Another kit later, and another messy bottling session, and a little bottler was invested in. What a fantastic little piece of kit that is! 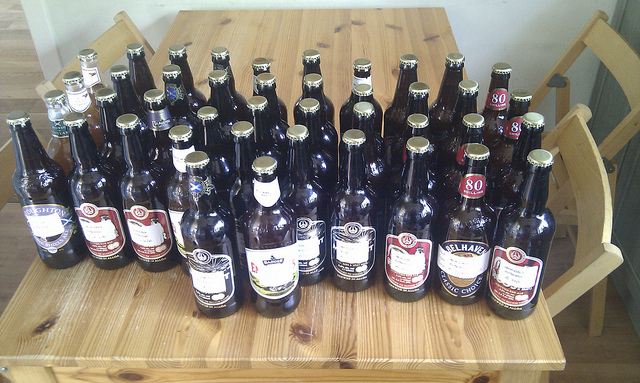 For £5 suddenly bottling is easy, controlled, clean and tidy. Cleverly positioning the dogs’ water bowl on the floor below the tap kept any drips or overflows contained, and the dogs happy. Fast forward a few months to the late summer, and several kits worth of beer are conditioning in their bottles, and the tall scotsman noticed a lump on his body where there shouldn’t have been one. One hernia operation later he was laid up at home with very little else to do apart from taking copious amounts of painkillers but to read the internet. Not all of it. Although at times it felt like it!! 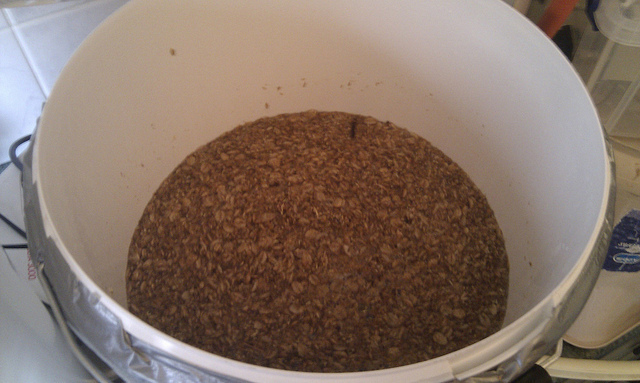 Of a growing interest was this strange concept of All Grain Brewing. What was this odd art? Why? After all, didn’t the kits do just what these AG brewers were doing? Only with much less equipment, space, and time…. And yet the results were widely touted as easily eclipsing even the very best kit. A quandry indeed. Curious about this,and keen to learn more, the reading began in earnest. There seemed to be an inordinate amount of money to be spent. Even doing it yourself, the welding of platforms and the cutting into shiny stainless steel all seemed well beyond the scotsman’s budget, or space. But there were alternatives, and much to his surprise, having got the green light from the Mrs (which she subsequently denied, but that’s another tale..) an order was placed for 5 large white barrels from an online place with a rather amusing title. If you googled Bigger Jugs would you too not expect to be treated to many images of ladies with overflowing assets? No? Just me then…. Four of the barrels were needed for the new brewery, and one would becone FV number 2. 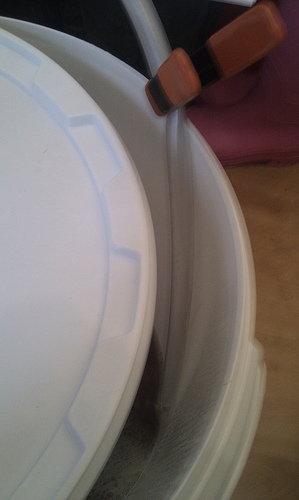 After much thought, the use of a second barrel within the Mash Tun to provide a false bottom was abandoned, adding FV number 3 to the growing collection. 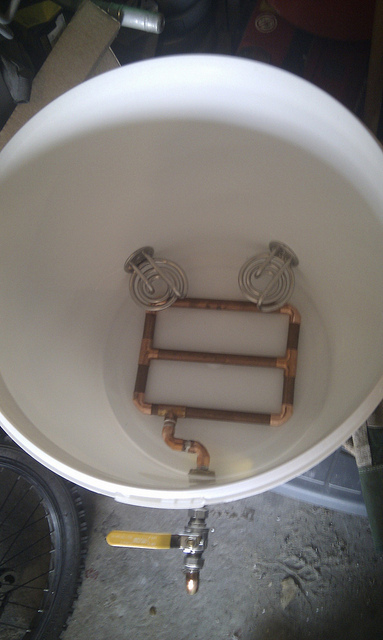 ruggling to spend much time on this new hobby, and in between hospital visits, two Tesco value kettles were procured, and the first of many visits to the Argos of the DIY world – Screwfix – for copper plumbing fittings. 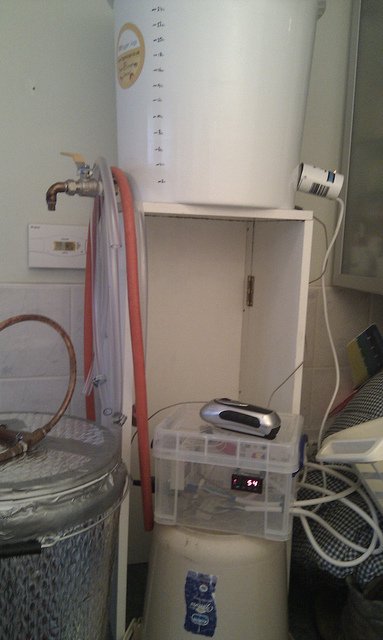 Many hours were then spent over the following days, and then weeks, busying away in the rather cluttered garage, fashioning a grain filter, a hops filter, cutting holes, fitting taps, bending copper pipe, learning the dark secrets of the world of flux, solder and a blowtorch. 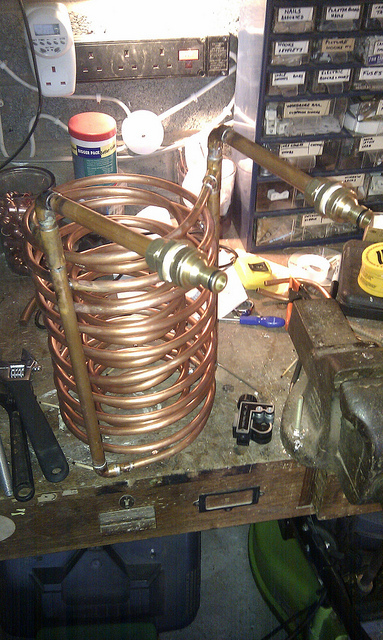 Eventually a working double coil immerssion chiller emerged from the garage and was tested, and then altered so it could be traded with a rather hairy member of THBF in return for a pressure barrel and another FV. Added to the existing FV from the kits, the spare FV made it a healthy 4 FV’s to provide space for primary and secondary fermentation, and the option to use the batch priming approach prior to bottling. 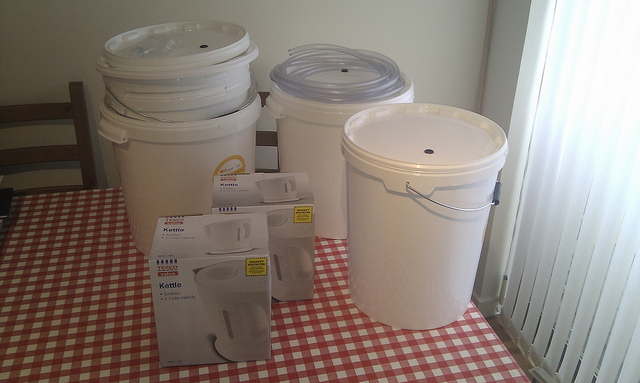 Pressure was growing in the house to remove the forest of white plastic barrels from the dining table, and a storage solution was needed for storage while the gear wasn’t in use. 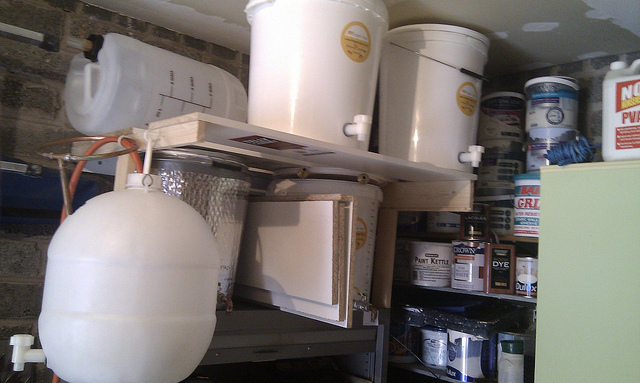 Happily, since this particular scotsman is rather tall, siting the new shelving on top of an already tall steel cabinet in the garage would still allow easy access, and so the woodwork commenced and with minimal materials (well, empty plastic barrels are hardly heavy!) 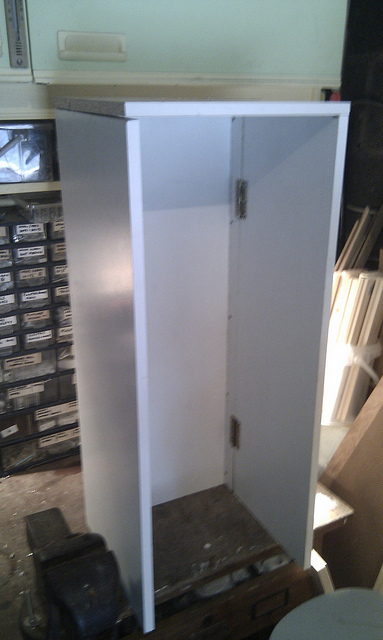 a shelf system was constructed and fixed in place. 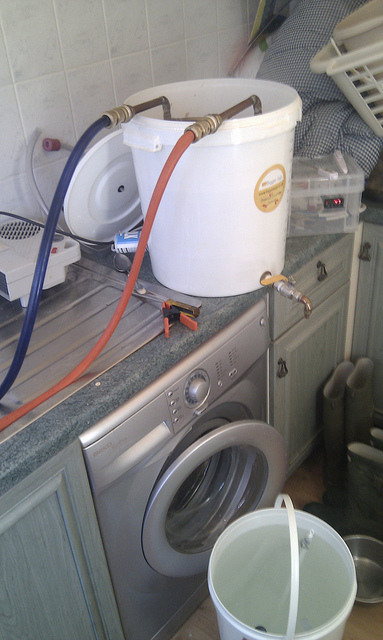 Realisation dawned that as pumps were financially out of the question, the force of gravity would be required, so a stand was needed to raise the boiler high enough relative to the Mash Tun. A selection of wood left over from a recent home DIY project, along with some old hinges salvaged off a an old fold away table left by the previous occupants of the house some 9 years previously created a stand that could be folded down and tucked away with the barrels in the garage. Spurred on by the sudden excess of FV’s, the final two kits, previously to be found languishing in a cupboard upstairs, were finally started. Of course this gave the tall scotsman another few weeks before there would be enough empty bottles to receive the first AG brew, and thoughts swung to the strike temperature… So many posts talked about these odd PID devices. Confident with sparky things, but mindful of budget, a PID was sought from China along with several PT100 probes. Alas, translated instructions are seldom clear and concise, and unable to fathom how to connect it all up, advice was sought and received (although here the help came from another forum ) and finally the dark workings of the PID were revealed and (mostly) understood. Realisation, and yet more questions led to the ordering of several Solid State Relays to complement the PID, and soon a plastic box found itself at the mercy of a Dremel, and became the host of all these electrical wonders. Eventually a solution was reached when it turned out that the 10mm nut on the 15mm to 10mm Reducing Coupler fitted the screw thread on the probe. a hole drilled in the tank and 2 ‘O’ rings pressed into service from diving days finally did the job!! Putting a three pin plug on the probe allowed the canny scotsman to use two probes – one for the boiler, and one for the mash tun, and smply plug the appropriate one into the plastic box of tricks. Eventually all good things have to come to an end, and so it was with the doctors line that had let this scotsman spend his days in his garage rather than actually earning his living. In a last hurrah before this free time ended and the delivery of brewing things would become more dodgy as couriers would be forced to ‘leave with a neighbour’ – usually a euphamism for ‘dumped behind your shed’ – exposed to the rain and maybe not the best storage place for 25kg of pale malt – a large amount of the AG brewing ingredients were ordered, and duly delivered. In an effort to protect them from a possible mouse attack while being stored in the garage away from the now disproving eye of the Mrs, a number of strong plastic boxes mysteriously appeared in the garage to accomodate this valuable store. Of course, homebrewing doesn’t always go to plan, and the painfully slow fermentation of the two kits kept of the first AG brew day an extra 2 weeks beyond the expected date. SO, early on a cold Sunday morning, a mere 40 weeks after that very first kit homebrew was started, the inaugural AG brew was finally started. The boiler was fed hot water to give it an easier job. 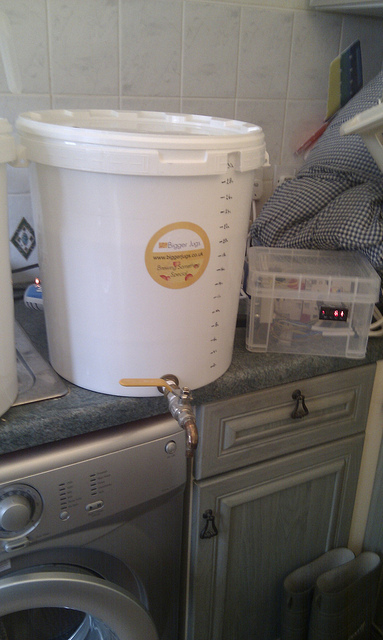 Time to start to sparge. 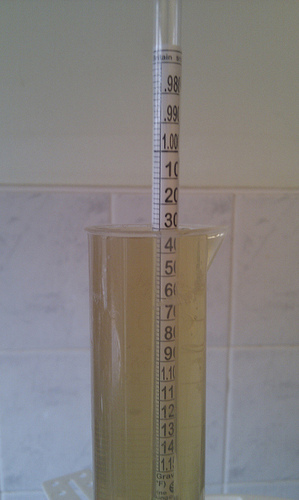 Stopped when I had 24 litres of wort and the runnings SG was approaching 0.990. 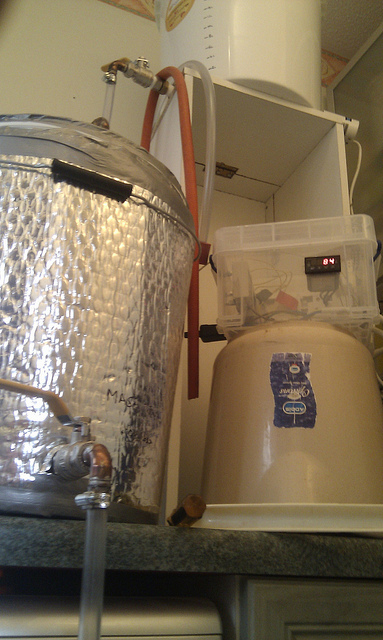 The boiler was lifted down from its stand, and the wort was jugged and then poured into it, and with the PID now set to 100c, settled down for the boil to get going. 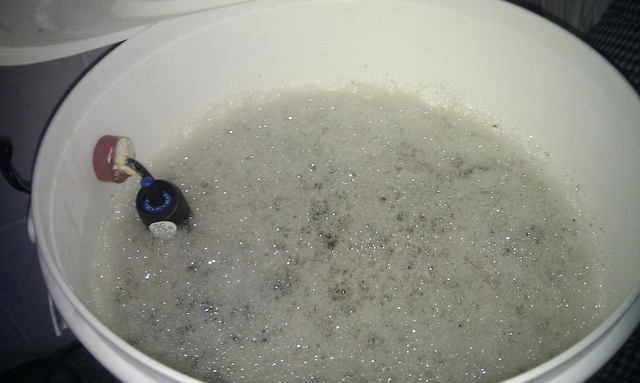 When it first reached the boil it foamed up like I really hadn’t expected. I chucked in the 4 litres I’d kept back, but not before the worksurface had a hot sticky covering. D’oh! 30 minutes later the fuggles hops went in. At an hour and a quarter into the boil, half a crushed protoflac tablet was added in and then the chiller was put in place to santise it. The volume had dropped a lot, thanks to some over vigorous boiling, so 2 L of boiled water were added to compensate. 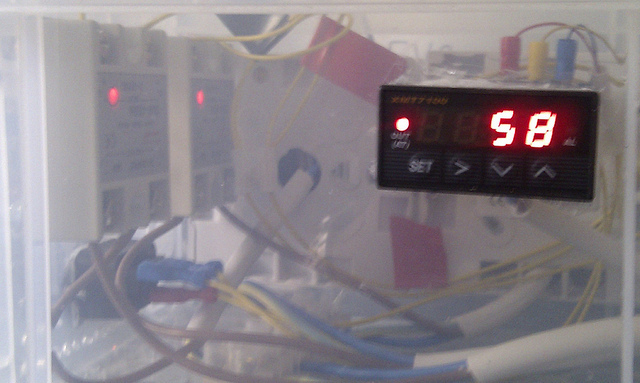 At 90 minutes the power was turned off to the elements, and the cooler was turned on, Leaving the PID on gave a constant readout of the dropping temperature. 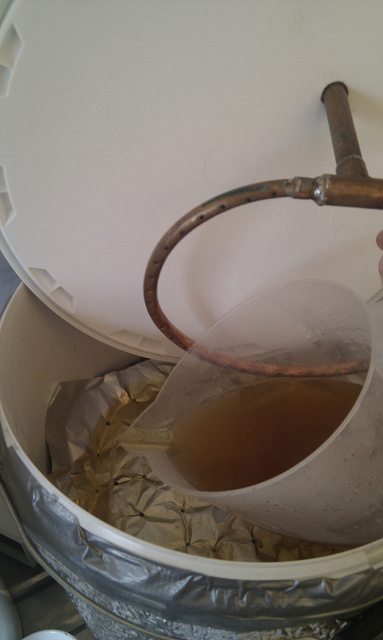 The waste water from the chiller was initially directed into the FV where it mixed with a sanitiser. 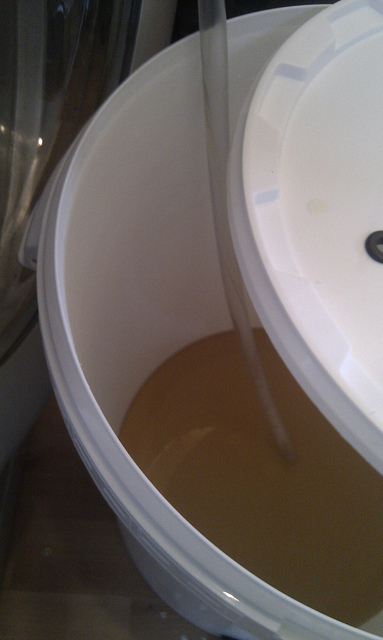 The stirring paddle, hose, trial jar and hydrometer were also sanitised. 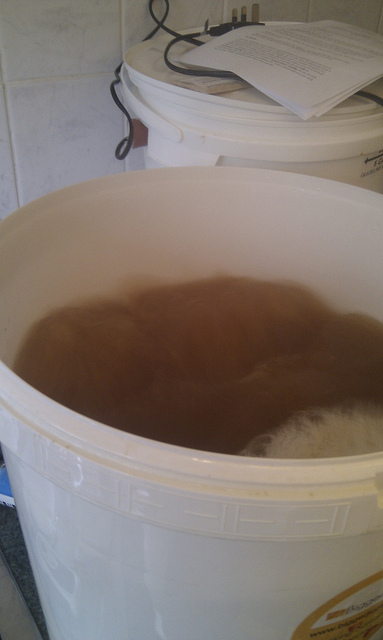 Once the FV was full, the flow was turned off briefly to let the outflow be directed into the sink instead. 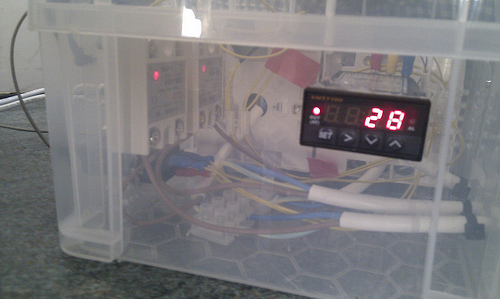 It only took 11 minutes to reach 28c! 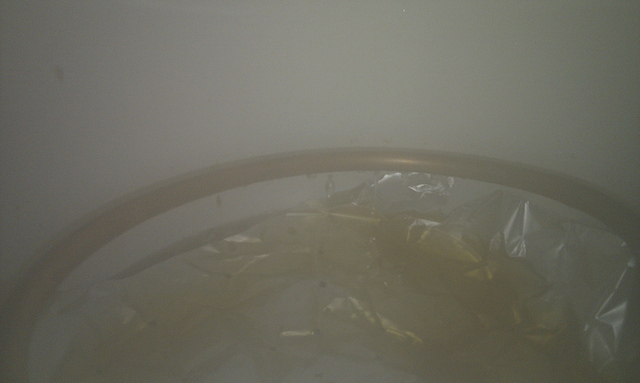 Finally the cooled wort was run, splashing all the way, into the FV. 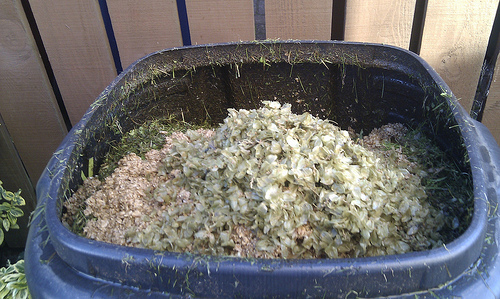 The boiler kept the hops inside it! 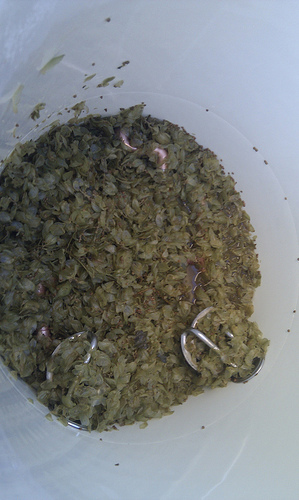 They were added to the spent mash in the garden compost. Looking forward to the first bottle! !